In February 2018, Luxembourg Ion Optical Nano-Systems sàrl, the latest spin-off from the Luxembourg Institute of Science and Technology (LIST), spread its wings. It will harness an innovative world-first technology, developed at the LIST laboratories, which allows the infinitely small to be explored at scales never previously achieved. Luxembourg Ion Optical Nano-Systems sàrl (LION Nano-Systems), founded in August 2017 with the support of the Luxembourg Institute of Science and Technology (LIST), flew the LIST nest in February 2018 to relocate to the Technoport, the national technology incubator. Dedicated to designing cutting-edge analytical instruments for scientists, LION Nano-Systems will market a remarkable tool from its Technoport base. This tool was developed by LIST researchers and has become the preferred option within the scientific community and among industry actors seeking to explore the infinitely small: the VECTOR500 SIMS. A commercial licence for this technology, which is protected by several patents filed by LIST, has been granted to LION Nano-Systems. Combining a powerful ion microscope and the VECTOR500 SIMS a Secondary Ion Mass Spectrometry (SIMS) imaging instrument with the highest resolution in the world creates a unique technology that enables scientists to conduct surface analyses at a resolution of around 10 nanometres, i.e. up to 10,000 times smaller than the diameter of a human hair. Whereas existing instruments only offer a resolution of 50 nanometres, the VECTOR500 SIMS gives users the most subtle and accurate possible knowledge of the analysed material, knowledge that is essential for uses such as developing various types of application, adapting production processes, and testing the success of a new product. This makes the VECTOR500 SIMS the best performing tool on the market for research and development applications in fields as diverse as nanoparticle toxicity testing, photovoltaics, semi-conductors, Li-ion batteries, steel, cosmetics and medicine. The history of the technology transferred to LION Nano-Systems began in 2011 when ZEISS was developing the Orion NanoFab, an instrument capturing images with ultimate lateral resolution., The Orion NanoFab did not include analytical capabilities a standard practice for competing technologies. At the same time, the Advanced Instrumentation for Ion Nano-Analytics (AINA) research team at LIST, led by Dr Tom Wirtz and specialising in developing scientific instruments for nano-analysis and nano-imaging, found a way, using specialised instruments, of obtaining such information. So ZEISS and LIST joined forces to try to marry the two technologies. After initial positive results, a first prototype was developed by LIST researchers, and then tested at LIST and ZEISS facilities. The presentation at international conferences and in specialised publications of the results delivered by this instrument, and its world-leading capabilities, immediately sparked interest in the scientific community and various industries. The two partners continued to collaborate and developed a full prototype of the SIMS instrument specifically for ZEISS Orion NanoFab. 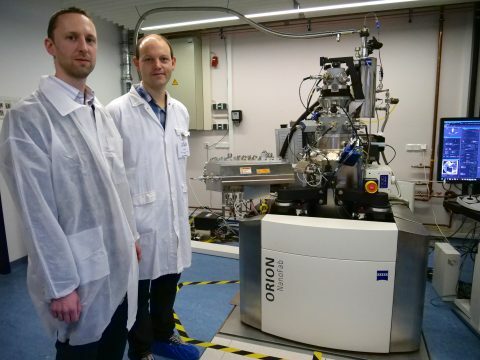 The resulting instrument is gradually revealing its extraordinary capabilities and ZEISS plans, with the continuing support of the LIST teams, to market the SIMS spectrometer as part of its ORION NanoFab product line. An early version of the technology has been designed, tested and approved on the sites of a select group of customers in Europe and the USA. In total, it took no fewer than four research projects, spanning over seven years and combining public, institutional and industry funding with, respectively, the support of the Luxembourg National Research Fund (FNR), LIST and ZEISS. These research projects started with fundamental research activities focusing on particle-matter interactions, followed by a prototyping phase to finally reach an approved and internationally recognised instrument. The transfer of the VECTOR500 SIMS technology marks the starting point of a close partnership between LION Nano-Systems and LIST, which will remain the spin-off’s preferred Research & Development (R&D) partner. LION Nano-Systems will thus benefit from this unique R&D potential in the field of scientific instrument development on the same campus, a real advantage for its business development. ZEISS continues to work with the AINA group researchers from the LIST’s Materials Research and Technology (MRT) department, whose activities focus on nanomaterials and nanotechnologies, durable composite materials, as well as production technologies and procedures. Both are working on numerous projects and activities to develop cutting-edge instruments, with a specific focus on instruments for the nano-analysis of semi-conductors, and on detecting nano-particles in biological tissues. These two partners are involved in major projects, including npSCOPE: A new instrument for physico-chemical characterisation of nanoparticles, a LIST-run European project dedicated to developing a new, integrated and optimised instrument for exhaustively determining the physico-chemical properties of nanoparticles, both in their original form and when integrated into complex matrices.